After spending the last ten years following her late husband on campaign, the irrepressible Jane Kimball finds herself badly in need of a position to support herself. Marriage holds no appeal; she's not likely to find a husband like her Jimmy again. But when Miss Thorn of the Fortune Employment Agency offers her a post with the Duke of Wey, Jane feels drawn to help the lonely widower with his three daughters. He may seem a bit aloof, but Miss Thorn's cat Fortune approved of him. Why should Jane doubt a duke? Alaric, Duke of Wey, commands his staff, his tenants, and the halls of Parliament, managing vast holdings in England and across the seas. Why is it he cannot manage his own daughters? As an old danger rears its head, he comes to rely on Jane's practical nature, her outspoken ways to navigate the waters of fatherhood. And when necessity dictates he take a wife, thoughts turn to an unlikely governess who might make the perfect bride. 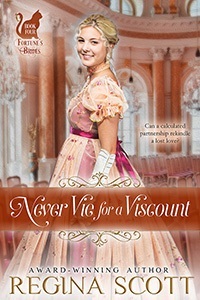 This sweet, clean Regency romance is the first in the Fortune's Brides series. Fortune's Brides: Only a matchmaking cat can hunt true love. 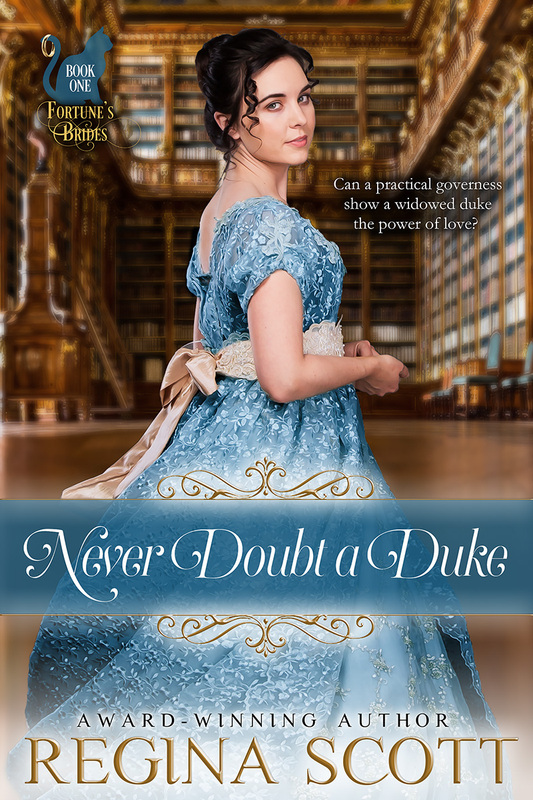 Never Doubt a Duke was awarded a Gem award from Kathy's Review Corner as one of the best books of 2018. It was also picked by staffers at Hope by the Book as one of the best reads of 2018. Becoming a governess was harder than fighting off Napoleon. Jane Kimball sat with her hands folded in her lap as the rickety hired carriage rolled through the countryside away from London and toward her new life. Every inch of her felt tight, as if her black mourning gown was suddenly several sizes too small. But then, some state of nervousness was to be expected. She hadn't tried to pretend she was a proper lady for a long time. "You are exactly what His Grace needs," Miss Thorn said from across the carriage. Jane still wasn't sure how the owner of the employment agency could be so certain. She'd thought when she'd answered the ad in the Times from the Fortune Employment Agency, seeking a governess, she might meet with a stiff-backed gentleman who would frown down his nose at her and inform her she was fit for nothing. After all, she had little experience and no references. Spending the last ten years following the drum didn't count. "I'll do all I can to make you proud, ma'am," Jane said. Miss Thorn inclined her head. Now, there was a lady. Jane didn't know the employment agency owner's background or why she seemed determined to help gentlewomen fallen on hard times, but she knew quality when she saw it. Everything from Miss Thorn's sleek black hair under the feathered hat to her elegant frame draped in a lavender quilted-satin redingote said she should be respected, admired. In comparison, Jane's thick brown hair seemed positively unruly, even wrapped in a bun and confined inside her plain straw bonnet. Her figure was solid; ample her husband Jimmy had called it. Her eyes were too dark a brown to invite confidences, and her navy wool cloak more practical than fashionable. Then again, Miss Thorn's pretty coat hadn't seen duty in Portugal. "You're nervous," Miss Thorn said, gloved hand stroking the short-haired cat in her lap. Fortune, she'd named the creature, and apparently the employment agency as well. At times, Jane wondered whether the cat was in charge. Miss Thorn certainly went nowhere without her pet. She was a handsome animal. The dove-grey fur was tailored like a morning coat, wrapping around her back and head to leave a white blaze down her throat like a cravat. Great copper-colored eyes gazed at Jane unblinkingly. "Very nervous," Jane admitted. "I'm glad I didn't eat breakfast this morning." Miss Thorn raised a brow, and Jane sighed. She never had understood why everything she thought popped out of her mouth. It had been a terrible failing in the daughter of a country vicar, where diplomacy was key. Even Jimmy's colonel had been taken aback a time or two. She was only glad her late husband and his friends had found the trait amusing, endearing. "Sorry," she muttered to Miss Thorn. "Habit." Miss Thorn glanced down at Fortune. As if she'd received a command from her mistress, the cat leaped across the space to Jane's side and rubbed her head against Jane's arm. Something inside her uncurled. "She is so sweet." "Only with those of whom she approves," Miss Thorn said. "I've known a few horses like that," Jane said, stroking a hand down the cat's thick grey fur. "I'm honored." Fortune blinked her copper eyes, and her small mouth turned up. It was as if she'd seen something grand inside Jane, something worthy of approval. Perhaps Jane could do this after all. "I'm going to miss her," she said, returning the cat's smile. "I'm going to miss you both. I don't know what I would have done if you hadn't agreed to represent me." Miss Thorn's gaze, eyes the color of blue lilacs, rested on her cat. "I cannot abide bullies. Being born to or otherwise acquiring power should not make a gentleman determined to wield it over others. It is my privilege to be of service to you, Jane." Another employment agent might have said the same, but Jane had never heard of any that worked so tirelessly. Miss Thorn had listened to Jane's story without judging and promised to find her a position where she would be safe, valued. When Miss Thorn had learned the constrained circumstances under which Jane was living, she'd opened her own comfortable town house on Clarendon Square. After that time, Jane had never felt alone again. Fortune had been ever at her side and Miss Thorn at her back. Jane refused to retreat now. Even if she knew next to nothing about being a governess for a duke's children. "Ah, here it comes," Miss Thorn said, gathering up her reticule. Jane peered out the window. They had been running past trees and fields above the south bank of the River Thames, the water glassy against a grey sky that threatened more of the snow they had seen earlier in the month. They appeared to have reached a side branch of the river, for the water was lower and murkier, ice crusting its surface. Ahead, twin gatehouses of a golden stone flanked the entrance to a gracefully arching bridge. "Wey Castle," Miss Thorn said as the horse's hooves clattered against the stone span. Jane stared at the looming walls, rising easily thirty feet above the crest overlooking the side stream. Rough stone blocks at one corner told of an older building on the site, while the smooth stone and gabled roof of the rest of the building gave testimony of a more recent age. Narrow windows reflected the heavy sky. "That's not a castle," Jane said, sitting back and glad for Fortune's presence beside her. Miss Thorn raised delicately arched brows. "No? The guide book describes it as such. I believe the tower at the southwest corner dates from 1360. But then, I suspect you have seen a few castles." She had. Egyptian palaces dating back to the time of Christ, Flemish fortresses from when knights on chargers roamed the land, and Portuguese marvels that had survived earthquakes. Jimmy and his regiment had fought below, behind, and inside them. She'd seen the massive stones pink in the light of dawn and red with the fire of defeat. The Duke of Wey's home didn't seem nearly so grand. The drive led up the crest and into a courtyard paved with cobbles, the house enclosing it on three sides. She felt as if a dozen eyes must be watching from all those windows. Funny how the windows looking in toward the courtyard were larger. Jimmy would have said the outer windows were narrow for protection, but it seemed a waste to be forever looking inward when a serene island and river lay just beyond. A footman with an old-fashioned powered wig hurried to lower the step. Fortune leaped back to Miss Thorn, who scooped her up into her arms. The butler, a regal fellow with thick white hair that was surely no wig, came forward and glanced between them. "Mrs. Kimball?" Jane could understand his confusion. Miss Thorn certainly looked more like a polished, proper governess. Miss Thorn inclined her head, the feather in her hat dipping just as respectfully. "I am Miss Thorn, owner of the Fortune Employment Agency. This is Mrs. Kimball. His Grace is expecting us." The butler took a step back. "You are indeed expected. Her Grace will see you in her chambers." Miss Thorn's smile was firm. "After we see the duke." The butler's look was equally unforgiving. "His Grace is very busy. He leaves all matters regarding the staff to me and all matters regarding his daughters to his mother." Interesting. She'd heard of wives taking such a role, but of course His Grace was a widower. Miss Thorn regarded him. "And that, I fear, is why you have gone through three governesses in the last year." "Three governesses?" Jane glanced to her benefactress. Why hadn't she been told? If three likely more-experienced governesses couldn't handle the post, what made Miss Thorn think Jane could? Even the supremely confident glow in Fortune's eyes couldn't stop the sinking feeling in her stomach. The butler answered before Miss Thorn could, his voice dripping ice. "Be that as it may, His Grace has not instructed me to bring you to him." "Then I suggest," Miss Thorn said, tones clipped, "that you consult with His Grace, or I will have no choice but to take my eminently suitable candidate back to London, where I assure you other noble houses are clamoring for her services." Doing it a bit brown. Jane clamped her lips shut to keep from stating the opinion aloud. 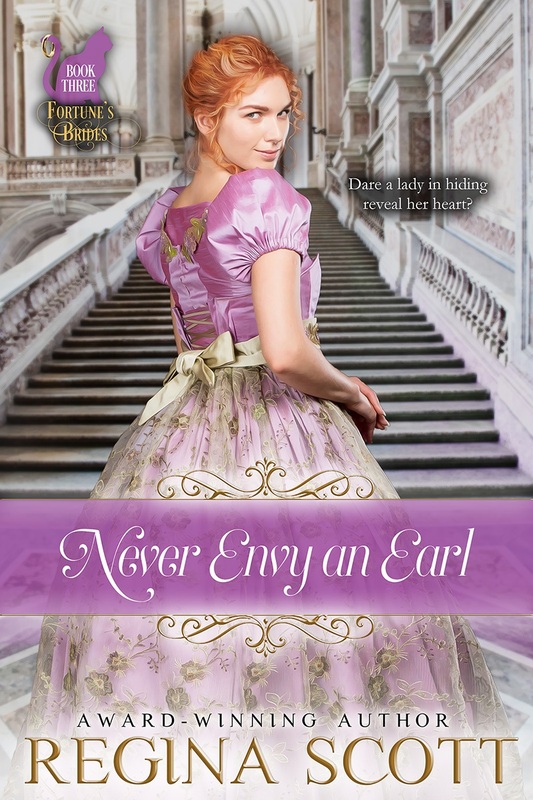 She wasn't all that suited, having only cared for Colonel Travers's daughter for the last year, and she sincerely doubted dukes and duchesses were coming to blows as to who had the opportunity to hire her next. But the butler glanced between them, and Jane tried to look as qualified as Miss Thorn had described her. It didn't help that she came no taller than the butler's rather impressive nose. Either she succeeded in looking proper, or the situation was more dire than she'd thought, for the man promised to return with an answer and left them in the courtyard. "Is the duke so cruel a master that he'd refuse to speak with us?" she murmured to Miss Thorn as they waited. "Not at all," Miss Thorn assured her. "I have it on good authority that he is even-tempered and fair." Some could have said the same of Colonel Travers. They hadn't seen him after he'd overindulged. Miss Thorn strolled back and forth across the cobbles, black boots tapping, as their hired coachman climbed down to see to his horses. The footman was eyeing Jane's meager trunk and worn saddle on the back of the coach as if wondering whether to port them into the house or heave them into the river with her alongside. "His Grace can be remote," her benefactress continued, "but he is not the chief problem here. The previous governesses were weak-natured, timid creatures, unable to stand under the demands of the position." Jane didn't question how she knew. Miss Thorn had been amazingly informed about Jane when she'd strolled into the coffee shop where they had agreed to meet the first time. She'd commiserated on Jimmy's death thirteen months ago and sniffed disparagingly at the way the colonel's wife had turned Jane out without a reference. Perhaps Miss Thorn knew the family here better than Jane had thought. Or Fortune had met the previous governesses and disapproved of them. The cat certainly wasn't sure of her surroundings now. Her head snapped left, right, eyes narrowing and tail lashing back and forth, as if she suspected each of the servants of some nefarious purpose. A ladylike growl came from her throat as the butler returned, head up as if he wanted no one to notice how quickly he walked. "His Grace will see you now." He eyed Fortune as if expecting to be given charge of her. Neither looked amused by the prospect. Miss Thorn swept past him for the massive double-doors of the house, and Jane could only follow. The entryway made her rethink her opinion of Wey Castle. The flagstone floor felt firm, determined beneath her boots. Dotted with bronze scones that had once likely held flaming torches and hung with tapestries in rich reds and vibrant blues, the walls soared three stories to a ceiling painted with the hosts of heaven riding into battle. The air hinted of beeswax polish and lavender sachet. It was all commanding with a touch of elegance. Her father would have been delighted to see her in such surroundings. He'd never understood why she'd run away to marry a cavalry officer. But then, for her and Jimmy, it had been love at first sight. They would have done anything to be together. She wasn't likely to find a match like that again. The butler ushered them through another set of double doors on their left and into a large room that somehow managed to feel cramped. Jane stopped to glance around and up, hand clasped to her bonnet to keep it from sliding back on her hair. Every wall save the rear was lined with floor-to-ceiling bookcases, with more jetting out at right angles, giving the library the look of a maze. So many books! Someone could spend a lifetime and never read them all, but what a wonderful challenge in trying. Books had been hard to come by in the field, closely guarded and shared only with trustworthy friends. This was true wealth. A mew from Fortune recalled her to her purpose. Jane lowered her head and made herself follow Miss Thorn and the cat deeper into the room. In the center of the space, surrounded by padded Moroccan leather chairs, stood an elegant teak desk with curved legs. She couldn't recall ever seeing the surface of the desks in the officer's quarters; they'd always been eclipsed by the sweep of maps, dispatches, and scrawlings of the battle to come. This one was so clean she could see the inlaid pattern of ivory in the shape of a unicorn, one leg extended and horn down, as if bowing to someone. Very likely the man standing behind the desk. The light from the slim, north-facing windows made him seem no more than a tall shadow. Her first thought was that he didn't look like a duke. Dukes should be hard, ruthless. Like some of Jimmy's commanders, they would bark orders, issue demands. This one had broad enough shoulders, but there was a stillness about him in his navy coat and tan breeches, like a lion about to leap. His warm brown hair was swept back from a heart-shaped face, and his eyes, like jade, narrowed. Oh, right. Wasn't wise to stare at dukes. Jane dropped her gaze respectfully. "Miss Thorn, Mrs. Kimball," he said. His voice was precise, polished, like the shiny top of his desk. "How might I be of assistance?" "It was my understanding you wished to engage Mrs. Kimball as governess for your three daughters," Miss Thorn said, one hand resting on Fortune's grey head as the cat draped along her other arm. "Surely you wish to speak to her first." "It was my understanding that Her Grace would interview Mrs. Kimball," he said. Jane glanced up to find him smiling pleasantly. "She's waiting upstairs." Very likely that was all it took. A gentle hint, a whiff of the power behind it, and everyone must do his bidding. Clearly, he expected the same from Miss Thorn. Miss Thorn did not seem inclined to oblige. "So we were informed," she said with a tight-eyed look to the butler, who was gazing impassively at the nearest bookcases. "However, there must be some mistake. A gentleman will want to ensure that the woman hired to care for his heirs is suitable." Something flickered across his face. Frustration? Regret? Dukes could not like being scolded, however veiled in polished prose. He spread his hands, the movement controlled, effortless. "I have complete faith in my mother. She chose your agency, Miss Thorn. I accept Mrs. Kimball on your recommendation." "A shame I cannot say the same for you," Miss Thorn said. And Jane had thought she spoke her mind too often. Was Miss Thorn intent on making an enemy? The duke drew himself up. "Do you doubt my word, madam?" Said in that steely voice, the question begged heresy. The butler's nose was distinctly out of joint as well at the slight to his master. Miss Thorn merely seated herself in one of the leather chairs, as if she were the hostess. "Do sit down, Your Grace. We have much to discuss." Clearly bemused, he sat. Jane took the chair closest to Miss Thorn. Fortune was wiggling, and she held out her hands to the cat. Miss Thorn released her hold, and Fortune arched up. Right onto the duke's desk. Jane tensed. This was it. He'd order them from his castle, or worse, confine them in the dungeons. All good castles must have dungeons. She edged forward on the seat, ready to bolt and take Miss Thorn and Fortune with her, if needed. Fortune stalked up to the duke and paused, tail lashing. The duke stared back, unmoving. Jane counted off the seconds. Fortune rolled over on her back and offered him her belly. Her purr echoed against the bookshelves. "Yes," Miss Thorn said, "I believe you will do nicely for Mrs. Kimball. Shall we begin negotiations?" Negotiations, the woman said, as if she would settle for nothing less than unconditional surrender. 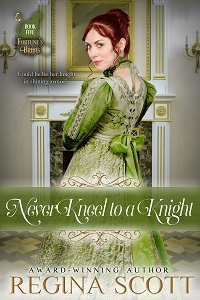 Alaric Dryden, Duke of Wey, had never met anyone like her, but he began to hope Mrs. Kimball had similar confidence. She was certainly sturdier looking than the last three governesses. He'd only glimpsed them on occasion. They had been willowy, elegant things, not unlike Miss Thorn, but with decidedly more submissive demeanors. The only thing remotely submissive about Mrs. Jane Kimball were her large brown eyes, reminding him of the little does that wandered the island on which the castle was built. She'd have to have more cunning than a doe if she was to deal with his mother. Despite his admonitions, Her Grace persisted on ruling over the nursery and schoolroom, as if no one could care for her granddaughters as well as she could. As she had not been a particularly doting mother, he found her sudden interest in the girls difficult to credit. "I was informed my mother already agreed on salary and half day off," he told the formidable Miss Thorn, fighting the impulse to rub the belly the cat had offered him. "We have a suitable room prepared, as you requested. What more do you require?" That purr was infectious. He wanted to smile along with it. Miss Thorn leaned forward. Mrs. Kimball was watching her as if she wasn't sure what the woman would do next. Alaric shared her concerns. "Mrs. Kimball will be caring for your daughters," Miss Thorn said. "She will assess the situation and bring you a plan for their curriculum." Mrs. Kimball started. Had she never devised a curriculum before? She seemed young for a widow, perhaps a few years his junior. Had her husband been a great deal older or died in some accident? Not that it was any of his business. "Furthermore," Miss Thorn continued as if his silence meant acquiescence, "she will report your daughter's progress each evening before retiring." A logical suggestion. His daughters seemed to change each time he saw them. He was kept apprised of every other area of his responsibility, by his steward, land agents, solicitor in London, the directors of the charities he supported, the prime minister. Why not his children? His mother could relay anything of import. "I'm certain Her Grace would agree with that," he said. Miss Thorn's purple-blue eyes pinned him in place. "She will report directly to you. She will take her direction from you. Anything else leads to anarchy." Mrs. Kimball blinked as if surprised by this revelation as well. Had the two women even discussed this situation? He had assumed an employment agency screened its clients closely. Perhaps he should be the one asking the questions. He returned Miss Thorn's forthright gaze. There was something vaguely familiar about the woman, yet he did not recall dealing with the Fortune Employment Agency before. Most of the castle's staff came from the island, and his mother or Parsons, their butler, saw to the hiring. He wasn't entirely sure why his mother had placed her trust in Miss Thorn. "And what about Mrs. Kimball's qualifications or experience makes it important that she deal directly with me?" he asked. "I'd as soon deal with your master of horse," Mrs. Kimball put in helpfully. "But I doubt he'd know much about your daughters." He sat back. He was used to determining the course of action, issuing orders, and seeing his will carried out. What was it about these women that so disarmed him? The cat slipped down into his lap and cuddled against his chest. Of course, Mrs. Kimball might well have reported to his master of horse. Very likely Mr. Quayle learned a great deal about the workings inside the great house from other members of the staff. Alaric did not like thinking how little he knew about his daughters. Each birth had seemed a miracle; the baby a fragile, precious life entrusted to his care. Evangeline had been adamant about his role. "Fathers groom sons," his late wife had said, pretty mouth drawn up. "Mothers mold daughters. The nursery is my domain, just as the estates are yours. I'm sure you wouldn't appreciate me interfering with the tenants, dealing with the flooding." That he had not been able to argue. His father had been preparing him for this role since the day Alaric had been born. But when Evangeline had died attempting to bear him a son and heir, taking the baby with her, he had had no idea how to deal with the daughters she'd left behind. He was petting the cat. He wasn't sure when that had started, but the movement of his hand and the purr rumbling out of her made his shoulders come down. Mrs. Kimball smiled at him, the look bringing out her cheekbones, the light in her eyes. "Hard to resist, isn't she?" He pulled back his hand and leveled his gaze on Miss Thorn. "If you tell me the only way Mrs. Kimball will accept the position is if she deals directly with me, then I must question the role you see her playing in this household." Mrs. Kimball's smile faded, and he almost called back his words. "You are entrusting her with the lives of the three people who must be most precious to you in all the world," Miss Thorn pointed out. "Inquisitive young ladies who have somehow managed to drive away every governess since their dear mother passed on. I know what I am asking may seem unusual, Your Grace, but if you continue doing what you have been doing, you will continue to see the same results." She had him there. This constant upheaval wasn't good for the girls, his mother, or the orderly household Parsons demanded. Why not try something different? "Very well," he said. "I agree to your terms." Mrs. Kimball brightened, until he added, "So long as you win over Her Grace." © 2018-, Regina Scott. All rights reserved.